Voles, sometimes called meadow mice, really like potatoes. If you’ve grown potatoes for any amount of time at your place, it’s a good chance the voles have discovered them and moved right on in. Before I grew so many cover crops, I mulched everything with leaves. Voles love the cover of mulch, happily going about their business (of eating potatoes) out of the reach of predators. As much as I loved mulching the potatoes with leaves, or anything else, I had to stop that practice. It turns out that voles also love living among the grain crops. More than a decade ago I gave up the leaves in favor of cover crops. I’ve been doing some great soil building and the voles appreciate every bit, living among the roots of the grains while they’re growing and when the roots are decomposing in the beds. I’ve changed up the preceding cover crop for potatoes, first with Austrian winter peas and now with oilseed radish. The winter peas were wonderful, leaving the bed friable and able to be worked by April 1, pulling out the green pea plants for the compost pile, but I still had vole problems. I was betting on the oilseed radish. After all, it’s a brassicus and potatoes and the cabbage family are supposed to be friends. Voles also love radish and their holes were evident through the winter where they’d feasted. One advantage of that is that I set traps and caught a few before the potatoes went in. I figure maybe I’m supposed to have vole problems, so that I can work on balancing that part of the ecosystem and give you some advice. This year I decided to address the vole problem head on. I scoured the Internet for suggestions and came up with a few to try. Adding greensand to the bed should help, said one source. I’m a little short on potash in my garden anyway and so I added greensand to every potato bed. Bury elderberry stems with the potatoes, said another source. Drop in some crushed oyster shells when you plant, urged my friend. Crushed oyster shells are something you can buy by the bag and are often used as a calcium supplement to feed to chickens. I planted potatoes six different ways to test all the ideas. I already knew that varieties make a difference and that the voles love the yellow fleshed ones more than anything, which is why I had long since given up growing Carolas, my favorite variety. One year when I did grow Carola potatoes, I also had Butte at one end of the bed. I remember that the voles took out the Carolas and slowed down considerably when they came to the Buttes. My choices for 2012 were Kennebec and Butte. As it turns out, they love Butte more than Kennebec. In my trials, the Kennebec yields were 1.6-2.6 times higher than the Butte yields, with the same planting methods. Adding elderberry to the plantings interested me, and we have elderberries growing at our place, so that was easy. I put elderberry leaves on top of each potato piece and buried green elderberry stems between the rows. That bed gave me the worst yield of all, resulting in 6.4 lbs/100 ft² for the Buttes and 17.2 lbs/100ft² with the Kennebecs. Remember we make no mistakes, only learning experiences. I learned not to try that again. One thing I had an interest in trying is to put a post in each potato spot with a plastic bottle on top to bang around and make vibration. I used old metal posts, the kind used for electric fence, for some of the posts and bamboo for the rest. I cut “wings” in the sides of the plastic bottles and cardboard milk cartons that I put on top of the posts, hoping the “wings” would catch in the wind and vibrate the posts, making conditions uncomfortable for the voles. Even rain should have caused some vibration. I learned that was nothing I need to try again, also. Dealing with the posts and bottles were a lot of bother, anyway. In that bed, I had a row of potatoes down the middle of the bed and I hilled around each one. On one side I set out cabbage when the potatoes were planted. The other side had snap beans, planted after some hilling had been done to the potatoes. Another year I had interplanted potatoes and cabbage and the voles took out the potatoes. Interplanting potatoes and brassicus is officially off my to-do list. Oyster shells seemed like a logical thing to do, reasoning that voles don’t like the rough surface, but I had tried that before. If it had worked as well as I’d hoped, I’d still be doing it. Besides, my soil didn’t need more calcium. However, my friend said he had good luck with that and urged me to try it again. I did, putting a handful of crushed oyster shells in with each potato piece, then soil, then shells, then topping with soil. Only Buttes were planted in that bed with a yield of 24 lbs/100 ft². Oyster shells are officially off the list of things to do again, also. I built a new 4’ x 8’ coldframe this spring. I dug everything out to about 15” and put ½’ hardware cloth in the bottom. 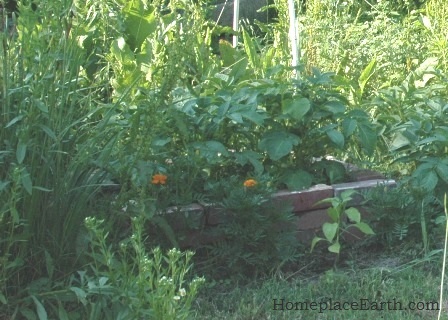 Then I built the sides with dry-stacked solid cement blocks, topping that with a wood coldframe, right out of Eliot Coleman’s Four Season Harvest. Although I needed it to grow seedlings, I wanted to first try it as a potato planter. I only had Kennebecs in there for a yield of 43 lbs/100 ft². I still found vole tunnels in this planting. The voles could have crawled in over the top (an edge sticking out from the coldframe all around might have prevented that) or may have gotten through a crack where the cement blocks may have shifted. Still, I had potatoes. Things were looking up. In one bed, I tried a variety of things. I buried large black plastic pots with the bottoms cut out, each with 2 potatoes; 2’ high circles of ½” hardware cloth dug into the ground about 10”, each with 3 potatoes; and potatoes planted loose in between these barriers. The Butte half of that bed yielded 35 lbs/100 ft² and the Kennebec yield was 71.8 lbs/100 ft². At the end of that bed I had built a planter, laying hardware cloth on the ground and making a surround 3 bricks high, filling it with soil. Into that I put 4 potatoes. Granted, it was a very small area, but the yield was 98 lbs/100 ft²! After fighting the voles for years, friends of mine had done something similar to grow their sweet potatoes in, with success. I would have thought the voles would just climb over the bricks to get in, but maybe they like to stay close to the ground. I usually space my potatoes equidistant, every 12”, but with the vole problems, I thought I might be making it too easy for them to go from one to the other. This year, in one 4’ x 20’ bed I put just two rows of 20 potatoes in each row, hilling each plant separately. The Butte half yielded 18.25 lbs/100 ft² and the Kennebec half gave me 30.25 lbs/100 ft². Comparing the Kennebecs in the hilled rows and the ones in the brick planter, 30 pounds is a lot less than 98 lbs. per 100 ft², but just about the same yield per plant. I could increase the yield in that bed with hilled rows if I interplanted something after the potatoes were hilled for the last time and if I was more aggressive about trapping voles early. The interplanted crop would have to be ready to come out with the potatoes. Our daughter, Betsy, Lightfoot Gardening Coach, and I have been exchanging notes on potatoes. This is her second year in a garden that she carved out of a field, double-digging the beds when she started. She had planted oats and oilseed radish in her beds preceding potatoes. Since we had such a mild winter, she had to chop the oats in and let that crop compost in place. She pulled the radishes for the compost pile. In “normal” years, if there is such a thing, those crops would have winter killed. She planted Elba potatoes and in the oats bed, with the potatoes planted intensively with offset spacing, she harvested 107 lbs/100 ft². In the radish bed she planted two long rows and hilled each row 3 times. Her yield there was 90 lbs/100 ft². Planting it that way, she used only about half the potatoes and came close to the same yield. She also noticed that the hilled Elbas were larger than those planted intensively. She planted Red Norlands in a bed that had oilseed radish over the winter. It was treated the same way as the hilled Elbas. There was lots of vole damage, producing a yield of 50 lbs/100 ft². She had noticed vole damage during the winter in her radish cover crop and had worried about this year’s potato harvest. She did okay, with bushels of potatoes for her larder. One good thing about keeping records is that it helps in planning for next year. I will continue working with Kennebec potatoes and will compare them to Betsy’s Elbas. I might grow a radish cover crop and trap the voles through the winter, something I should have worked more on this year. I’m going to be looking at different preceding cover crops and planting in hilled rows with space for possible interplanting on the sides. Although I don’t like to do much cultivation, I think regular cultivation and hilling helps deter the voles. Hoping to develop an ecosystem that makes the voles stay away voluntarily, I’ve been adding daffodils to the perimeters of some beds (have yet to see that as effective) and have added castor plants to the garden. In the end, it will be everything together that determines success—variety, planting and cultivation, soil fertility, weather, etc. Wishing you success in your potato endeavors. Do you have any potato/vole experiences you would like to share? 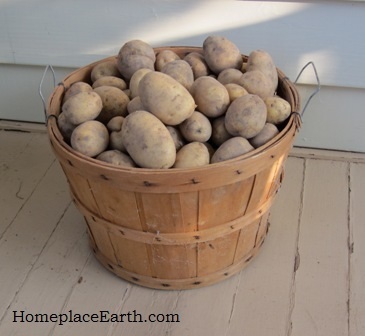 Where did you put your potatoes after harvest? I harvested 33#s and eventually blanched 22 #s and put them in the freezer. I don’t have a basement or a root cellar. I sort them and store the smallest ones and damaged ones in a bin in a cool cabinet in the kitchen to be used first. The medium and large ones are in separate baskets under a table in the sunroom for now, covered by newpaper or burlap. I save some of the largest for planting next year. They could just as well be in baskets in a shed to cure. Our house is not air-conditioned. You can find bushel and half-bushel baskets for sale at farm supply stores. Or you could put them in cardbooard boxes or brown paper bags. Sometime in October, before the first frost, I get around to putting any I have left to store for the winter in 10 gallon plastic boxes and put them in our crawl space. That is shown in the cover crops video at the end of the November chapter. The plastic boxes have holes drilled in them for ventilation. Hi Cindy, I can’t grow vegetables since my yard is very shaded. However, we are plagued by voles too. My husband dilutes caster oil and puts it in the holes. It works because they go away. Of course, sometimes they just relocate from the front yard to the back yard or vice versa. But, I think eventually they will figure out they’re not welcome in either yard, get tired of the castor oil, and move on to greener pastures as they say. I’m glad you have good luck with castor oil. Back around 2000 a castor oil product came on the market. The label said it was to use against voles and you could use it in your vegetable garden. I tried it, but didn’t have much results with the voles. A couple years ago I came across another castor oil product in a garden center. It said to use against voles and moles, but it didn’t say anything about using it in vegetable gardens, so I emailed the company and asked. Their reply was that they don’t recommend it for vegetables because castor oil discourages germination. I suppose if the potatoes are already growing, germination is not a problem. If I did buy something to use against the voles, such as castor oil, I would have to apply it to lots of beds (potatoes, sweet potates, & peanuts) at the same time, and reapply in a timely manner, otherwise, they would just move on over to the other beds. I’ve read that some people have good luck by growing castor plants in their garden, so I’m going with that. Nice article! can you post picture of your new coldframe? I wonder if the short article in Mother Earth Magazine would work for you? Issue 52 page 10 states to use old tire casings and as the potatoes begin to grow add more mulch and some more dirt to more layers of tires. With your idea of using a hardware cloth barrier at the base, by using some soil and mulch to each layer perhaps the voles will be defeated. Article says you can continue to add dirt and tires for about two months giving you a tower of 4-5 tires. Harvesting would be simplfied,by lifing up a layer of tires as product is needed and winter storage is already accomplished by leaving some potatoes in place. Or just push the tower over and harvest all of them. Some say that very little dirt is needed to raise potatoes. 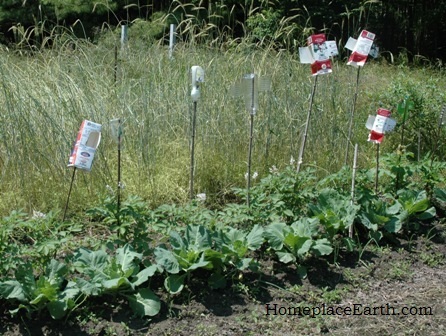 Maybe you wouldn’t need to use your prime garden plot. Thanks for the suggestion Chuck, but I don’t want to grow my food in tires. I could use something else, though. A quick check on the internet talks about potato towers being built with wood boxes. It sounds like many people who went with potato towers didn’t meet with success. I also have a problem with remembering to water containers, which is what I would have. I tried to grow potatoes in a large plastic tub before with no luck. This weekend at the Mother Earth News Fair someone told me about trying to grow potatoes in a tower–don’t remember the details except he was using Yukon Gold potatoes and he said they only grow potatoes at the bottom, not up the stem. Which varieties are used might make a difference–if they get watered. If anyone out there has had success with potato towers, please add your comment. Thanks for giving details on things that didn’t work; I’d tried several of those ideas with effectively no success, and you’ve saved me the effort of bothering with some of the others. Voles drive us crazy on the predominantly no-till farm that my husband & I run in central Missouri. One of the problems is that they eat the seeds of legumes (esp. peas & edamame) before germination, and I’ve struggled to come up with ways to get around that. I decided to put castor bean seeds in with the peas every ten feet or so this spring, thinking they might bite into one of those after chowing down on peas and decide to stop eating, but I’m not convinced there was any benefit. I’m not convinced that trapping can provide meaningful control, either, because voles reproduce at an extraordinary rate. According to the book, The Wild Mammals of Missouri, a meadow vole in captivity “produced 17 litters in one year, and one of her daughters produced 13 families totaling 78 offspring before she was one year old.” With reproduction rates like that, I think we’re much better off doing everything we can to provide habitat for predators rather than trying to directly control voles ourselves. Owls like to use trellis posts as perches from which to hunt, and we’re pretty sure they help us out some. Snakes are even better since they can hunt the tunnels, and they seem to provide some level of control during the warm season. (I was very happy to find a prairie kingsnake’s hind end poking out of the ground in the newly planted sweet potato beds this summer.) We’ve talked about maybe someday building a snake hibernaculum, or at least piling up some rocks to provide a nice sunning area. In the end, I think we’re going to have to learn to live with some vole damage, but I’m always on the lookout for other successful control methods, as well. Johanna, thanks for writing. I encourage predators in our garden, also. I have some large plastic tubs (from trees) that I use as large flats to start peanuts in for later transplanting. Otherwise the voles would get the seeds. I haven’t seen any immediate affect the castor beans I’ve been growing have had on the voles, but they are beginning to come up here and there on their own around the garden and I let them. I’m not looking to eradicate the voles, just develop a balance. It was interesting to take the time this past summer to try out those things with the potatoes. Next year I’ll be hilling them and see how that goes. old post i know, but i was also wondering about the encouragement/introduction of a natural predator back into the system. as joanne mentioned, owls, snakes, has anyone had experience with introducing a cat or ratter-sized dog into the equation? i would be concerned a dog would dig in the bed to get at the voles in the roots, destroying the roots in the process, but what about a barn cat? Natural predators are encouraged and we see snakes in the garden. The neighbor’s cat patrols the garden regularly. I bet you are talking about my yellow “Sammy Cat” that went to “Rainbow Ridge” a couple months ago. I miss him so much and yes, he was constantly catching moles and mice. Bet you will be missing him too. Yes, I always loved seeing Sammy Cat in the garden, but I never actually saw Sammy carrying any voles out of the garden. I am interested in buying vole-eating snakes for my garden such as black rat snakes. I am in western North Carolina , has anyone had experience with this? I respect and admire your approach and your mind set regarding the vole invasions. Unfortunately, man is merely a minute part of nature and no matter what rationale you apply to your well intended efforts, the voles will continue living and eating as will the sun continue to rise and the weeds continue to grow. Vole populations are cyclic and peak every three to five years favoring open marshy grassland and old field environments. It is possible for females to bear their first litter at 3 to 5 weeks old and with a gestation period of 20 to 23 days it is possible for one female to produce between 70 and 100 young in a year, and their daughters can add to all that when they reach 3 to 5 weeks old. Ironically, voles are an essential component to the health of the soil and the ecosystem that you both share. The meadow vole is an important food source for many predators, and they disperse mycorrhizal fungi. Voles are major consumers of grass (like quackgrass) and disperse grass nutrients in their feces which feeds the soil. As a seasoned and passionate organic farmer I have learned to cohabitate with both pest and beneficial life forms recognizing that the voles, despite being annoying and persistent consumers of my root crops, are biologically programed to survive and they do not care what YOUR goals are, they will continue on because they are better at living and survival than most people born after 1970. The do no conform to the weak and self serving human society nor do they suffer from modern mental slavery. They march to the beat of the supreme drummer. You have two choices: Either you take extreme, annual and costly measures to fundamentally change your land/garden practices consequently destroying the natural flora and fauna balances, or you simply learn to accept the diversity and complexity of nature… and plant enough potatoes for you and the voles and put up owl and rapture nest boxes or encourage the habitation of short tail shrews, weasels, garter snakes and corn snakes. Man cannot live on potatoes alone, diversity is healthy and good for all life. If you change the way you look at things…the things you look at change. The best of luck and healthy growing. Thanks for fall the great information about voles. This is exactly how my tubers look…very frustrating. I grew my main crop under black plastic and hilled them with straw. QUESTION; is this what your vole damage looked like?? As you know the Yukon were clustered at the main stem interface but yield for theses plants was 2X the hill grown (1/3 bushel for two tubs) with NO vole damage. The German Butterball vines are just starting to die back so do not know exactly the yield or dispersion of the tuber set (but from gentle probing I can feel tubers growing the whole way up the vines). I will let you know. I also very much try to use only sustainable and natural items (hilled raised beds, compost tea, fish, kelp, mycrozi – emulsion as only fertlizer and cover crops…if the test is successful. I will find biodegradable containers or sacks to grow my families potato crop. Thank you for your site…I have started read your other links on the right, awesome! Tom, yes that looks like vole damage. Sometimes they eat the whole spud and leave nothing. Voles particularly like yellow fleshed varieties and will take them first. I’m glad you found a potential solution with the tubs. Whatever you use in the future, keep in mind that the voles could crawl over the sides and into them. Smooth sides and a lip on the edge would be deterrents. I use tubs to grow corn and peanuts for two weeks to transplanting size to keep the seeds from the voles but don’t want to keep them watered for longer term crops like potatoes. Also, I don’t want to have to empty them to get the potatoes. You don’t mention where you are from. Here in Virginia we have voles. At Ecology Action in California they have trouble with gophers eating their potatoes and other crops.